One Patient Pathway trial date set…first up, one day trial on 4th February. Exciting times! The mention of root cause analysis, fishbone diagrams and the ‘5 why’s’ tends to make eyes glaze over and people to subtly creep towards the door. During the 2 Kaizen days back in November we confronted the concepts head on….and came away with some rather beautiful diagrams. During the first session we looked at a variety of data collected on the Emergency Department and its performance. One of the key areas identified as something we wanted to tackle was the variability of patient experience. Why is it that a patient that hasn’t met their care provider by the 2 hour mark is more likely to creep over 4 hours? Is it just that we should employ more care providers? The data collected suggests there may be more to it. One of the biggest problems teased out by the pretty pictures was the lack of consistency between shifts, between staff and between patient load. That is to say that everyone manages the shop floor differently and the style of management changes depending on the clinical need. Only natural, but you can see how it can be confusing to those around you as their role changes for each shift. This is where the One Patient Pathway came from. A desire to create a pathway that can function at all times of the day, for all levels of demand and in doing so improve patient flow and the patient and staff experience. That is the goal. The One Patient Pathway combines and builds on the success we have had with our Majors Triage and Minors RAT models. All patients (except resuscitation cases) will be met by the Emergency Department Triage Team who will triage and front load assess them. They will determine which area of the department the patient will be seen in and they will start appropriate investigations. The care provider will then assess the patient and make a plan for further investigations, specialty referral, admission or discharge. The hope is that the front load assessment and streaming of patients will lead to a more efficient system, less congestion in our clinical areas and improved patient flow. Before implementing the pathway we are going to have a couple of trial sessions. There will be a one day trial on February 4th and a one week trial over the week beginning 10th February. All feedback will be gratefully received! 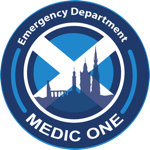 Newer PostWhy is Edinburgh EM different?